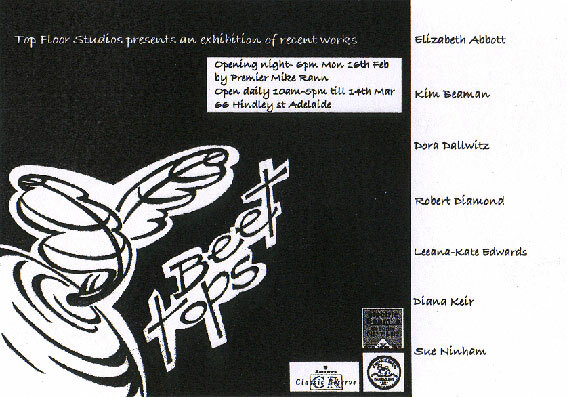 Topfloor hosted a mixed exhibition called BEET TOPS during Adelaide Fringe 2004. The opening date for the exhibition was Monday February 16, 2004. Artists included Dora Dallwitz, Elizabeth Abbott, Rob Diamond, Sue Ninham, Diana Keir, Kim Beaman and Leeana Edwards exhibiting artworks ranging from sculpture and installation work to painting, textile art, printmaking, fashion and more. All the artists who exhibited had/have permanent studio space at Topfloor, 66 Hindley Street, Adelaide.